MACtion is exactly what sports bettors need for a midweek pick me up, and there are two compelling games slated for Wednesday night. 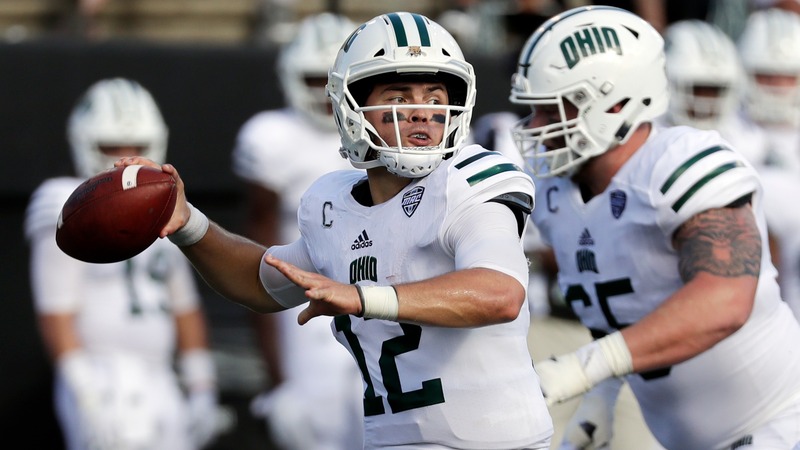 MACtion is exactly what sports bettors need for a midweek pick me up, and there are two games slated for Wednesday night: Ohio at Miami (OH) and Toledo at Northern Illinois. Oddsmakers expect both contests to be close. Ohio opened as a 3-point road favorite at Miami (OH), but the point spread has been bet up to -4. The Bobcats have the 25th-ranked offense in the country, racking up 463.4 yards per game. It is a balanced attack, too, the running game contributing 236.6 of those yards per game. But the bread and butter is Nathan Rourke, the Bobcats' dual threat QB who has 13 total touchdowns (eight passing, five rushing) during the Bobcats' three-game winning streak. Ohio averages 33.6 points per game on the road, which far outpaces the 24.5 points per game that Miami (OH) scores as the home team. Miami (OH) is 1-0 as a home underdog. In the second game of the night, Northern Illinois is a field-goal favorite at home against Toledo, although -3.5 has flashed on Las Vegas oddsboards, too. The Rockets feature the more dynamic offense in this one, averaging 440.1 yards per game. The game has massive implications in the race for the MAC West title. Either Northern Illinois or Toledo has represented the division in the conference championship game seven of the last eight years. Toledo (3-2 in the MAC), however, is in desperation mode Wednesday night. At 5-0 in conference, NIU has a firm hold on the race. Here’s how the betting numbers shake out for Wednesday night’s MACtion. __MORE:__ [College football Week 11 betting lines](https://www.betchicago.com/college-football-week-11-betting-lines-ohio-state-michigan-st) ## Ohio at Miami (OH) betting lines 6:00 p.m. CT on ESPNU __Point spread:__ Ohio -4 __Total:__ 61.5 __Line movement:__ Ohio opened at the Westgate Las Vegas SuperBook as a 3-point road favorite, but has since made the jump to -4. At William Hill sportsbooks, the total has been bet down from 62.5 to 61.5. ### Ohio betting overview 2018 SU record: 7-1 2018 ATS record: 6-2 2018 O/U record: 5-3 S&P+ rank: 57 Off. S&P+ rank: 12 Def. S&P+ rank: 109 Special Teams S&P+ rank: 50 __Note:__ S&P+ rankings are an advanced data set of tempo- and opponent-adjusted components of the five factors of college football: Efficiency, explosiveness, field position and finishing drives. Per creator Bill Connelly, a fifth factor, turnovers, is informed marginally by sack rates. ### Miami (OH) betting overview 2018 SU record: 6-3 2018 ATS record: 6-3 2018 O/U record: 6-3 S&P+ rank: 72 Off. S&P+ rank: 84 Def. S&P+ rank: 58 Special Teams S&P+ rank: 47 ## Ohio at Miami (OH) betting trends --The Bobcats are 4-0 ATS in their last four conference games. --The Redhawks are 0-4 ATS in their last four home games vs. a team with a winning road record. --The Bobcats have won the last five meetings with the Redhawks and have covered three in a row. --Under is 4-0 in the last four meetings in Miami (Ohio). ## Toledo at Northern Illinois betting lines 7 p.m. CT on ESPNU __Point spread:__ Northern Illinois -3 __Total:__ 55.5 __Line movement:__ Northern Illinoi opened at -3, jumped to -3.5 briefly but is back down to -3 at Westgate. ### Toledo betting overview 2018 SU record: 5-4 2018 ATS record: 4-5 2018 O/U record: 6-3 S&P+ rank: 62 Off. S&P+ rank: 19 Def. S&P+ rank: 106 Special Teams S&P+ rank: 22 ### Northern Illinois betting overview 2018 SU record: 6-3 2018 ATS record: 5-4 2018 O/U record: 2-7 S&P+ rank: 78 Off. S&P+ rank: 122 Def. S&P+ rank: 14 Special Teams S&P+ rank: 121 ## Toledo at Northern Illinois betting trends --The Rockets are 1-4 ATS in their last five games after scoring more than 40 points in their previous game. --The Huskies are 4-1 ATS in their last five games overall. --Under is 6-0 in the last six meetings between these two programs. --The road team is 6-1 ATS in their last seven meetings.